Pyongyang appeared to be developing a new weapons system capable of launching submarine-based ballistic missiles, Seoul’s Defense Ministry said 16 September 2014. “Based on recent U.S. and South Korean intelligence, we have detected signs of North Korea developing a vertical missile launch tube for submarines,” a ministry official said. Ministry spokesman Kim Min-seok told a regular press briefing that the North’s 3,000-ton Golf-class submarine could be modified to fire medium-range ballistic missiles. “However, there is no confirmed information yet that a North Korean submarine capable of launching ballistic missiles is in operation,” Kim stressed. "There is no intelligence yet that North Korea has an SLBM in operation. But the possibility of a North Korean submarine equipped with an SLBM has been detected recently," said an official document submitted by the Joint Chiefs of Staff (JCS), according to Seoul's Yonhap news agency. North Korea already had submarine-launched ballistic missiles (SLBMs). The North obtained several SS-N-6 SLBMs and associated technology from Russia in the 1990s, and the missile design was adapted into North Korea’s new intermediate-range missiles. Although Seoul claims Pyongyang did not have submarine-launched ballistic missile (SLBMs) technology, certain developments in this area of technology had been reported. In September 2014, South Korea’s Joint Chiefs of Staff said that “there is no intelligence yet that North Korea has an SLBM in operation. But the possibility of a North Korean submarine equipped with an SLBM has been detected recently,” as quoted by the International Business Times September 14, 2014. Pyongyang had reportedly launched a new submarine capable of firing ballistic missiles. Government and military sources in South Korea said in early November 2014 that Pyongyang had imported a Soviet-era Golf class diesel submarine built in the 1950s and modified it. 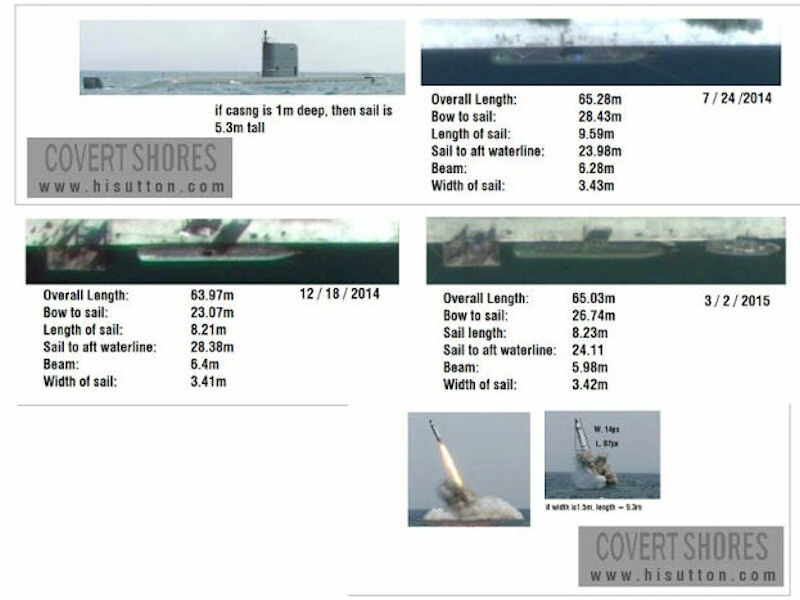 Sources said the newly launched submarine is identical to an unidentified submarine at the Sinpo shipyard that the US-based website 38 North revealed in October 2014. The new vessel is estimated to be 67 meters long, 6.6 meters wide and has a dived displacement in the three-thousand ton range. Adding to the concern about the new submarine is the operation of a test facility at the Sinpo shipyard that 38 North reported in October. It was reported the North had carried out dozens of tests on the ground and at sea to mount a missile tube on the vessel. A military source in Seoul said Pyongyang's new submarine will pose a threat if the North completes testing for a vertical launch of missiles, estimated to take two years at most. To counter the threat, South Korea plans to launch three 3,000 ton submarines with vertical missile launch tubes by 2020 and an additional three by 2030. On 28 October 2014 the US expert Joseph S.Bermudez Jr. reported that the North has a new submarine-based ballistic missile testing facility in vicinity of Sinpo South shipyard. "It would take one or two years before the North completes the test for the vertical launch of missiles from the sea," South Korea’s military said. The single completed 2,000-ton, 67 meter-long Gorae submarine is thought to be based elements of old Eastern Bloc designs. The design may be influenced by older Yugoslavian designs such as Heroj and Sava. South Korean media has suggested that North Korea managed to reverse-engineer or modify one of the old Golf-II hulls that North Korea imported in early 1990s. The design may well be influenced by Soviet Golf class submarines, but the Korean submarine is significantly smaller than these designs. The first released pictures of the submarines were associated with the test of the missile KN-11. There are openings on the conning tower that indicate the presence of tubes for launch of 1 or 2 missiles, after the fashion of the Soviet Golf and Hotel submarines. A 28 November 2015 ejection tube launch failure that damaged North Korea’s first missile submarine, which officials. A Gorae-class sub conducted a test ballistic missile launch – in contravention of a UN resolution – on 09 July 2016. It was the third such test since December 2015, and while it was a failure, the launch proceeded to a further stage than the previous two. Although less sohisticated than western or South Korean systems, a missiel firing submarine would represent a significant advance for the submarine fleet of the Korean People's Navy. Some hfae suggested that if the design is successful, the Sinpo class could replace the aging Romeo-class submarines. It may be a one-off experimental submarine.